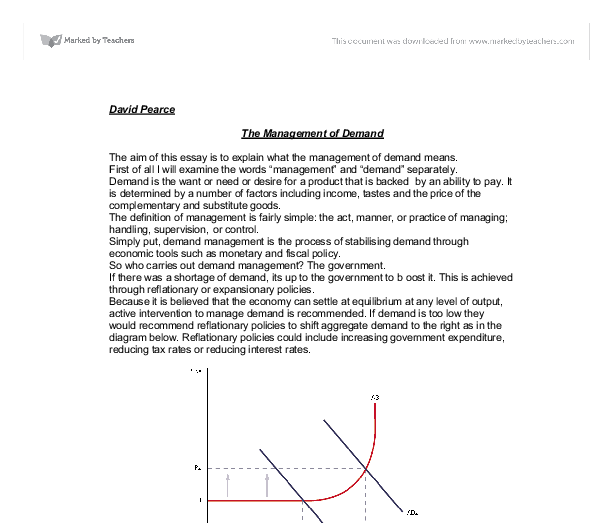 David Pearce The Management of Demand The aim of this essay is to explain what the management of demand means. First of all I will examine the words "management" and "demand" separately. Demand is the want or need or desire for a product that is backed by an ability to pay. It is determined by a number of factors including income, tastes and the price of the complementary and substitute goods. The definition of management is fairly simple: the act, manner, or practice of managing; handling, supervision, or control. 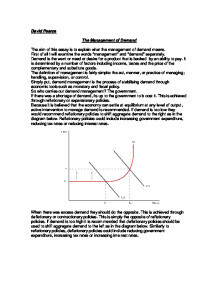 Simply put, demand management is the process of stabilising demand through economic tools such as monetary and fiscal policy. So who carries out demand management? The government. If there was a shortage of demand, its up to the government to boost it. This is achieved through reflationary or expansionary policies. ...read more. Monetary policy is used by the government to change the supply of money and interest rates to achieve desired economic policy objectives. They aim therefore to influence the level of economic activity. The government may want to use their monetary policy to either boost economic activity (if the economy is in a recession) or perhaps to reduce economic activity (if the economy is growing too fast, causing inflation). The following flow diagram shows the process clearly: Increase in interest rates --> less disposable income --> less consumer expenditure --> decrease in aggregate demand --> fall in inflation Or alternatively: Decrease in interest rates --> more disposable income --> more consumer spending --> increase in aggregate demand --> rise in inflation Fiscal policy is the stance taken by government with regard to its spending or taxation with a view to influencing the level of economic activity. ...read more. The multiplier is concerned with how national income changes as a result of a change in an injection, for example investment. It is said that any increase in injections into the economy (investment, government expenditure or exports) would lead to a proportionally bigger increase in National Income. This is because the extra spending would have knock-on effects creating in turn even greater spending. The size of the multiplier would depend on the level of leakages. It can be measured by the formula 1/(1-MPC) where the MPC is the marginal propensity to consume. The multiplier can be used to predict the impact of a change in aggregate demand on income. The size of the multiplier is related to the decisions households take about saving and consumption. The greater the amount of any increase in income which households spend on consumption, the greater will be the final change in income and therefore the size of the multiplier. The slightest increase in aggregate demand can lead to a far more significant increase in Income. ...read more. SERVICES The Education Affairs and Services have been provided with Rs 12214 million in the budget estimates 2004-2005 as compared with Rs 9640 million under the revised estimates and Rs 9645 million in the budget estimates 2003-2004 respectively. The bulk of expenditure, that is Rs 7920 million has been allocated for Tertiary Education Affairs and Services in budget 2004-2005. If, however, its resources are fully employed, it will have to rely on increases in resources or more likely, increases in the quality of resources There is conflict between consumption and investment. Economic growth can be achieved by increases in investment, but increased investment is at the expense of expenditure on consumption goods.